...for warm, woolly socks, long nights lit by candles, and marathon knitting! As I have mentioned before, I am not a big fan of winter weather. And the last two weeks have reminded me why, with a cold snap of temperatures in the minus forties, before the windchill. Top that off with a couple of power outages that shut down the fan on the furnace, and you have one cold, cranky woman on your hands. However, this nastiness has given me an excuse to wear all my little self-indulgent socks that I've been knitting. Now, I knit a lot of socks. There is always a sock-in-progress in my purse, for those moments when I am waiting in line, sitting in a coffee shop, or stuck in traffic. There is usually a half-knit sock on the coffee table, too. But do I personally have a large collection of hand-knit socks? Of course not! I don't really know where all those socks I knit go--kids, Steve's sock drawer, friends, I suppose--but sometime last winter, I realized that I had only 1 pair of my own knit socks, and they were looking pretty threadbare. So on my travels over the spring and summer, I collected a few little skeins of, shall we say, indulgent sock yarns. Alpaca blends, silk blends, superwash Merino--handpainted and luxurious. Mmm, mmm, mmm. And then I used the hours in airports, on airplanes, and in the passenger seat to actually use these yummy yarns. I made myself some socks. First, the alpaca blend. Handpainted yarn from Alpaca Plus, 60% alpaca, 20% wool, 20% nylon. The knitting was done in May and June, mostly on planes while I did my little stint in the US. These socks did sit in a drawer for a couple of months, but I'm wearing them now! They are warm and have developed a slight halo from the alpaca that makes them feel super soft. 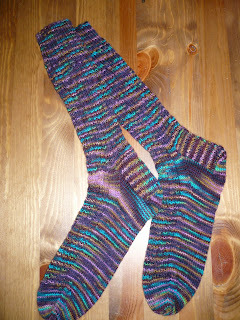 The next pair I knit were a Merino/silk blend from Red Fish Dyeworks. The four-ply yarn was a little on the heavy end for socks, and a little dear with 5 skeins costing about $85, but I wanted the colors together. I do have enough for about 2 more pairs of socks, so the cost will even out when I get those guys knit. 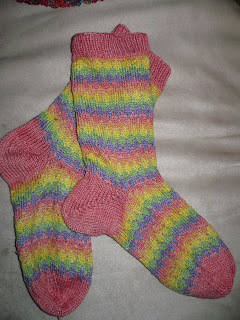 I knit these during Fibre Week and into early August, using my basic sock formula and a simple Fair Isle pattern. I must admit that these are my current favorites--the combination of the silk and the bright colors make me happy every time I put them on. And last, but far from least, are these beauties. There was a great frenzy of knitting in August, getting the first sock finished in about 2 days, then...nothing. I cast on the second sock in early October and knit about 3 inches of cuff, then...nothing. Then it got to be 30 below, and I decided to sit in my house and knit. 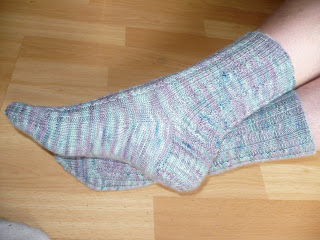 I finished the second sock on a Sunday afternoon two weeks ago. The yarn is handpainted by Mary Ann at Three Waters Farm. I loooove the colors! And these soft, comfy socks have gotten a lot of wear this past couple of weeks. So, my toes have been warm and very stylish during the cold spell. The long dark nights and the cold, cold weather have not been very conducive to a festive state of mind around here, but things are looking up. We are having a heat wave of -23C today, and the Christmas baking is done. The tree is up, and there are even a couple of gifts wrapped. I ventured out yesterday to the post office and the mall, two place I usually try to avoid this time of year, and everyone I met was cheerful and helpful. And the dark drive home at 3:30 p.m. was lit by Christmas lights. And my toes are warm. So glad your toes are warm! I am working on my second sock of first pair, tried cabling an improvissed pattern, glad to know I can cable now! Anyhoo, do you have any advice for setting up a blog? my techno skills are needing assistance to tackle this interesting concept. Happy Merry Christmas, I enjoyed reading about your travels in twelve days just now. Healthy thoughts to you too, I am recovering from a wicked cold and almost 96.9% better. Knitting to recover, hmmm maybe there is a theme here?